In the first release of this article I said "don't use the compass." I got flack from many cachers with much more experience than I had at the time who rely on the compass the way I rely on the Map. I haven't been able to understand why they prefer it -- perhaps the Map screen isn't as useful on Garmin units. But I know this, it's a mistake to ignore the weight of that kind of experience. So, now I say, you need to figure out which display works best for you -- the Map or the mock compass. Some units don't have a Map screen. In that case you don't have a choice. Most of this article applies whichever one you use. Update: I now use a Garmin 60CSx and the map screen works even better on it. I think the map screen on the blue Legend doesn't work so well. This may account for why Garmin users (who often began with this unit) prefer the mock compass. My unit has another screen that's supposed to look like a highway and I guess you're expected to try to walk on the highway to get to the destination -- phhhht!. (Is that how to type a raspberry sound?). My unit has a fair degree of configurability, so I hide the compass, the highway and a couple of other screens I don't use for geocaching and don't want to have to leaf through to get to the screens do I use. I only use three of the available screens. It's fun to check your speedometer against your GPSr's speed reading about twice, then that screen's just in your way. The Map screen is the one in the Figure below. The two other screens I check occasionally are the one that displays the current coordinates (called the "Position" screen on my unit), and the one that shows your satellite pattern and signal strength ( it's called, appropriately enough, the Satellite screen, and on mine it also shows battery condition). On the Garmin the current coordinates are also shown on the Satellite screen. Most units have an alarm to alert you if you've lost satellite data. Be sure it's turned on so you don't find yourself following bogus readings. Note 1 -- On some Garmin units you must change the way bearing is displayed by going to a menu item called 'Heading' (go figure) and change it from "Cardinal Letter," which means N, S, E, W to "Degrees," so you can actually see what the bearing is. Knowing the bearing is kinda, sorta in the direction the sun rises is useless. Finally, you have to make a configuration change to the Map screen to set the black arrowhead so it always points in the direction you're facing (see Figure below). On Magellan units the default has the arrow always point north. This means it's constantly changing -- that hurts my mind. [I think some Garman units have a little walking man where the arrowhead is and I think it comes set correctly.] Finally, I select the options that set the Map detail to Low to minimize the stuff shown on the Map screen. If you don't do this it can be cluttered making it more difficult to use. If there were a way to turn off everything except what's shown in the Figure I'd do it, but I haven't found a way to do this. Once I've parked, if I'll be going out of sight of the car in a wooded or confusing area I create a waypoint at the car so I can find my way back. Also, if your unit supports a "backtrack" mode (Garmin calls it TracBack) be sure it's enabled. Practice switching to this mode, so if you get lost you can find this mode to retrace your steps. If you don't practice there's a good chance you won't be able to figure out how to use it when you need it. This Figure shows the screen I use almost exclusively. Zoom out until you see the the cache. Walk towards it checking the distance and direction occasionally to see how far you still have to go. Zoom in as you get nearer. If you run into obstructions or heavy growth try different ways around it while watching the cache position looking for an easy way to it. The graphical display only works while you're walking. When you stop it becomes useless. [This is also true of the mock compass.] But, the Distance to the target is always working (assuming you have satellite data). Note: If you want to try the mock compass, a good time to switch to it may be when you get within 100-200 feet (30-60 meters) of the target/cache. I use the distance value to home in on the location. When you get within about 10-15 feet (3-5 meters) of the target stop moving and watch the distance value until it settles down. My Magellan unit required a minute or so of settling time after you get to this point. My Garmin requires less settling time. Now, move a step or two forward and see if the distance becomes less. If so, move forward again. If instead the distance gets greater, go backward until it reaches a minimum. Then, repeat this seeking behavior by moving to the right (or left). As you repeat these movements you will continue to decrease the distance to the cache coordinates. If you are able to get the distance down to 5-7 feet you're as close as you're going to get using your GPSr. From here on it's 'ol-fashion hunting. This doesn't mean the cache is 2 feet away. There's error in your reading and additional error in the cache owner's posted coordinates (maybe a big error). To get a feel for your own error check the EPE value. (Now you know why I have the EPE on this screen.) If your unit supports WAAS a very good EPE is around 7-10 feet. More than 25 feet is poor, and 50+ is very bad. 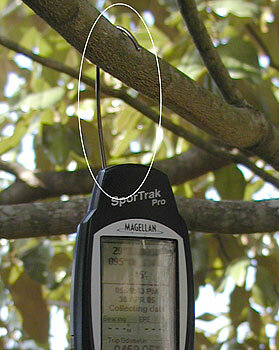 Typically, when you're as close as you can get using your GPSr, you'll be within 15-25 feet of the cache. Without WAAS your error may be much greater, but the technique's the same. Sometimes, particularly in tree cover, the device just keeps slowly drifting/wandering. Other times it jumps around -- I don't know why. In these cases I spend a while hunting then repeat the distance dance. After that, it's hunt-hunt-dance . . . hunt-hunt-dance . . . hunt-hunt-dance . . . until I find it or give up and go home reminding myself how much I enjoyed visiting this new place -- occasionally muttering self deprecating remarks (not really). You may want to paint it so it will be easy to find when you drop it in the leaves. I've spent far too much time looking for it. And, I've had to make six of them because I couldn't find the one I dropped in the leaves. My latest is painted with apple red fingernail polish. Update: Now I've lost it. For just such times, I show Bearing on the Position screen. For your GPSr to work with a compass it needs to be set to Magnetic North. [It's beyond the scope of this article to explain how to follow a bearing using a compass, and I didn't find a good article on the web.] Bearing is the angle between north and the cache. Point one arm toward north and the other toward the cache -- the angle, measured clockwise, between your arms is the bearing of the cache. The GPSr gadget knows the bearing whether you're moving or not. By entering the bearing shown on your GPSr on a compass, then orienting the compass to North it will point toward the cache coordinates. You can simply walk a little way toward the coordinates and repeat this on a trial-and-error basis to move closer and closer to the coordinates, or you may want to try this "triangulation technique." When using this method, I flip over to the map screen occasionally to see how far I am from the cache. The question of which setting you should use is asked regularly in the Getting Started Forum at gc.com (geocaching.com). First, this setting has nothing at all to do with classic geocaching. It has to do with compass readings, not latitudes and longitudes. So, whether you set your GPSr to True or Magnetic north makes no difference whatever in finding a cache using Lat/Lon. It's used occasionally in "offset" or "multi" and maybe mystery/puzzle caches. Usually to "project" a waypoint. Projection is beyond the scope of this article. It's also used in conjunction with a compass under certain difficult field conditions -- See triangulation technique mentioned just above this sidebar. Compasses use Magnetic North -- not True North. Maps use True North. Some people will say "My compass reads True North." They're just confusing the issue. You can make a compass read true north, but this involves making certain adjustments for your particular location based on a factor called declination. And, this factor (and thus the adjustment) is different for every place on earth. The bottom line? In my opinion, set your GPSr to Magnetic North until told by cache instructions to do otherwise, then set it back when you're done. If you intend to use maps a lot with your GPSr, set it to True North. There's much difference of opinion on this. If you want to read more about the subject go here and here. Good luck and if you found this article useful email me.